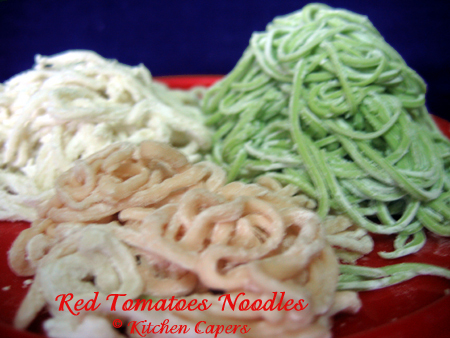 ** I added Ketchup to give the noodles a nice soury flavour as fresh Red tomatoes tend to be very sweet when its ripe. 1. Blend tomatoes to puree state. 2. Sieve and discard seeds. 3. Add water to Tomato juice and it should measure up to 180ml. 4. Mix the juice and ketchup together. 5. Then add all the ingredients together to form a dough. 6. You don't have to rest the dough. 7. Break into smaller pieces and run it thru the Pasta machine till it comes out smooth. 8. Cut according to the shape/size you like. just wondering why you didn't have to rest the dough for this one? Will it be better if I rest it though? coz its not meant to be la mian texture. want it to be nice and firm. Thus didn't rest it too long. Gina, Hi, can i know that , 3 pieces of red tomatoes is = how many grams?